158 Responses to "About Moi"
wow amazing translating 70 books!!! I hope you are fine and carrying on the great work you have been doing at your blog. I am Amna Gilani from The Pakistani Spectator (TPS), We at TPS throw a candid look on everything happening in and for Pakistan in the world. We are trying to contribute our humble share in the webosphere. Our aim is to foster peace, progress and harmony with passion. We would like to interview you for our website to facilitate the bloggers and other aspirants for blogging. Please send us your approval for your interview in your reply to this email, so that I could send you the Interview questions. We would be extremely honored. Thank you for subscribing to my blog. I plan to visit and savour your writings whenever possible. May I congratulate you on being nominated for the Candle Lighter Award. Well, it isn’t a material award, nor is it a competetive one. It’s just a, kind of, acknowledgement or appreciation of the blogs one likes. I took the post, that I did for this one (and some others), down. But I will link you to another similar one. Everyone’s a winner in this 🙂 . You may, or may not, do the post, as you please. This link might give you a hint on what such posts are like. Umr ji I know its not material award but award is award 🙂 like other awards i got———- so does it have a design or just words? thank you for prompt reply. Wow! 70 book translations… You have been very busy, and now you’re blogging too. Hi Tanveer, thank you very much for coming to my poetry site and “liking” so many of them. All the best to you, Tanveer. Hello there my wonderfully talented friend! I have nominated you for the ‘Blog of the Year 2012 Award’! Please, check out my blog for the details! no my dear. I am very sorry as i was and am very sick. It is alright…get well soon! WOW 70 books ? You are a great great writer ! I am glad you joined this platform too ! Love your writings ! I will be glad if you accept. and thanks so much for liking my posts “My Step Mom’s Coconut Pumpkin Pie” and “Sometimes you have to put your blinders on and settle in” and “Keep your legs closed” and for stopping by my blog. Tanveer… I saw you subscribed to my blog… so, welcome… I hope you enjoy my somewhat heavy, but, hopefully, humorously oriented blog…. What makes you think you have the right to dictate morality to children? But where does your morality come from and how do you know it’s right? It is wonderful to know you write stories for little children for instilling moral values. I feel this a great cause for the future generations. Kind regards and a lovely blog. Thank you for the follow on my blog. Congratulations on the fine work you are doing for others. Thank you for following my blog, http://thefinalcurtain1.wordpress.com – I wish you all the very best. Have you seen the movie about his life? Thank you for visiting my blog! I am delighted to know that you are a writer and that you are into children’s books. Alhamdulillah! Glad you’re here. Thanks for following. I was surprised when the notification showed there’s you. But I was blessed to find you and I hope I can visit this place often…Children books? wow! I think I should search more about Indonesian child stories for you one day. Insha allah, after holiday I’ll try to forward it. May we can exchange the children stories from both parts. Because I also love it. You sound incredibly busy. Hope you had a great weekend. Mom and I wanted to send a great big, “Thank You!” your way. It’s a pleasure to have you join our site. We pray you continue to visit and that you’re uplifted and encouraged. 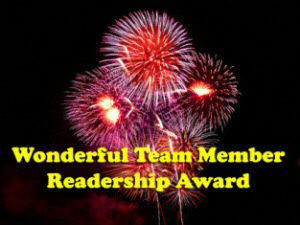 I am awarding you with the TEAM MEMBERSHIP READERSHIP AWARD! You can go to the above address and find the LOGO for this award! If you cannot find it…email me…and I will locate it for you. The RULES are as follows:—just follow each one…point by point…if you PRINT out the example I sent to you in your email, you should be able to follow the rules one by one. IF you run into a problem, EMAIL ME! I love your blog, it is essential to my journey!! Love and Light to you! Thanks a lot Rachael for dropping by. your words are much appreciated, do visit again please. I just seen that you have just started following my blog. I came to see what you are writing about on your blog. I really enjoyed the post on the benefits of Honey and cinnamon. I am looking forward to reading more. Thanks for the follow, I was taken by surprise and when I read about you I am in awe. Look forward to reading your blog. Have a great day! Thank you for visiting my blog. I came here and enjoyed what I read. Very interesting your blog!I’ll follow you! You are doing such a great job!! Thank you for stopping by my blog and following it. It’s greatly appreciated. It’s nice to visit your very interesting blog. Assalamu’alaikum, my dear friend! Alhamdulillah I’m so glad to know you, masha’Allah a great translator, 😉 You should share your ability in translation, sister! 70 books? How many times you needed to translate them? Awesome! That sounds real interesting, you have written a lot. I like your subject matter. I try also to impart good morals to my grandchildren, and a love of nature. I must read some of your books. Hi Tanveer Rauf. We are pleased to meet you and learn or your following our little site noting stories of our travels and the wonderful people we meet. In looking through your site we realized it is going to be great fun tagging along with you and seeing the world through your eyes and words. In the mean time keep looking up and moving forward one step at a time.